Just go ahead and call it Death by Chocolate Chip Cookie because this giant is accordingly heavenly! Gooey, warm cookie dough, covered with ice cream is almost sinful but if eating it is wrong then I don’t want to be right. I can’t master making good soft cookies if my life depended on it. But these are my salvation. I dislike hard cookies very much; they must be microwaved before consuming. Even with Oreos I open the package and wait for few days until they have softened to eat them, if my hiding place hasn’t been discovered. No Oreo cookie is safe from the husband. Husband likes any type of cookies. He is truly the cookie monster and this cookie is exactly what the monster needs (And monster’s wife, as well). In the bowl cream together butter, margarine and sugars until well blended. Add vanilla and eggs, one at the time and beat until well incorporated. Add flour, salt, baking soda and baking powder and mix until just combined. Finally add chocolate chips and fold gently until well distributed. The cookie batter should be somewhat thick. Preheat oven to 375 degrees Fahrenheit. 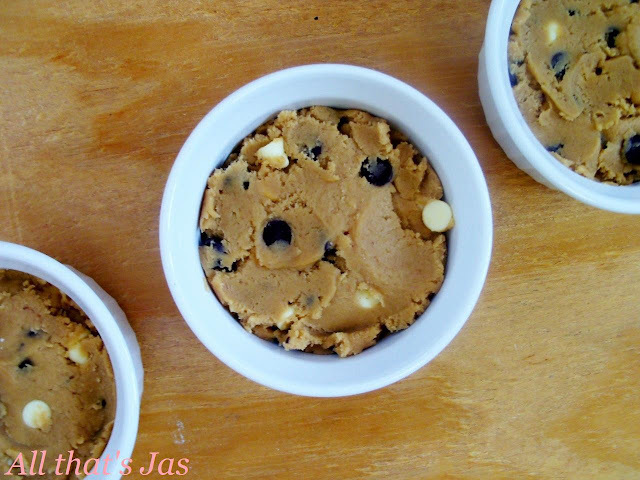 Fill ramekins ¾ deep with room temperature cookie dough. Set ramekins on baking sheet and bake on the middle rack of the oven for 15 minutes, or until the top is golden brown. You want cookies to be slightly undercooked. 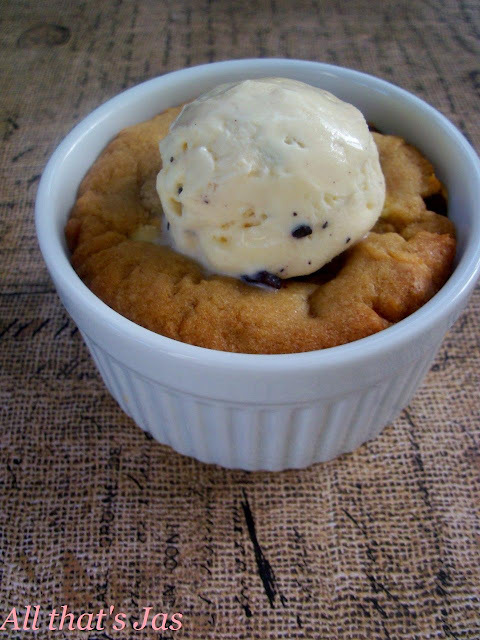 These are best served straight from the oven topped with vanilla ice cream. Cover the bowl with plastic wrap and chill dough for at least an hour. Meanwhile, preheat oven to 375 degrees Fahrenheit. Scoop out balls of dough using medium cookie scoop (about 2 tablespoons) and place each on baking sheet lined with parchment paper or silpat. Bake for 15 minutes on a rack in the upper third of the oven until lightly browned. Remove from heat and allow the cookies to stay on the sheet for additional 2 minutes. Transfer the cookies with parchment paper to cool surface. Allow the cookis to cool on the paper for at least 3 minutes before serving.